Niagara Health is recognizing all of the Nursing Excellence Award nominees for their commitment to extraordinary care. 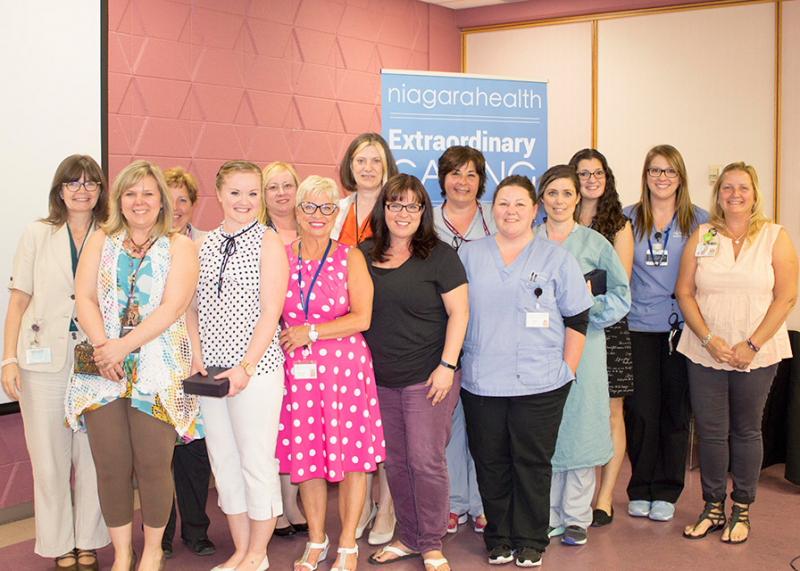 This year’s nominees represent an extraordinary group of nurses who demonstrate compassion, optimism and are committed to achieving ambitious results and are living our Niagara Health CORE values every day. The awards are held each year during National Nursing Week. As a leader in the Peritoneal Dialysis Unit, Arden sets the highest standard of quality, safe care for patients and families. Arden advocates for her patients to help them maintain optimum levels of wellness and independence. She sets the bar at the highest level, and her patients, their families and her colleagues are the fortunate recipients of her unfailing caring, compassion and professionalism. Alice has a positive attitude. Her colleagues love working with her. She makes patients and their loved ones feel calm and important, even when things are hectic. She keeps her colleagues informed and up-to-date of necessary information. Sheryl has an attentive and caring nursing approach. She builds strong connections with her patients and works well with the multi-disciplinary team, assisting patients with their rehabilitation and allowing patients to return to the comfort of home earlier than planned. Sally is a great advocate for patients and committed to improving access to palliative care. She has been instrumental in providing education to her colleagues about the approach to palliative care. Sally always puts patients first and encourages them to contact her anytime, even after hours. Rebecca meets every challenge with competence and grace. She is always looking for new ways to improve the program to achieve better patient outcomes, nursing efficiency and team satisfaction. Her role requires patience, empathy, assertiveness, perseverance, professionalism and clinical competence, and Rebecca exemplifies all of this. Nicole is very attentive to the needs of all of her patients. Nicole was caring for a young man with glioblastoma whose wife wanted him home for the holidays. She worked with community partners to coordinate all of the necessary home support to make this wish come true. Sandy is one of the most approachable people you will ever meet. She immediately puts patients and their families at ease. Sandy is well respected by all nurses, patients, families and physicians. She is on a continual quest for knowledge and is very supportive of those in her department continuing their education. Kim quickly identifies opportunities to enhance both patient care and employee experience. She often stays “under the radar” embedding herself within her team to uncover opportunities for continual improvement. Kim consistently leads by example, setting the stage for her team to be successful. Lisa provides exemplary leadership for the Operating Room team. She initiates activities that support achieving our strategic priorities. Lisa provides her team with ongoing support and communication, especially during difficult situations. The Geriatric Assessment Program - both inpatient and outpatient teams - work collaboratively with each other, with the geriatricians and with patients and their loved ones to provide extraordinary care to elderly adults in our community. This small team works hard to provide the best care possible to the growing number of older adults in our community. By remaining focused on safe, quality care and maintaining a positive work environment, the Port Colborne Urgent Care Centre operates like a “well-oiled machine.” Team members look out for one another, using each other’s strengths to deliver great results in a friendly warm environment for staff and patients. Andrew has a tremendous amount of initiative and continually brings forward ideas for improvement. He joined the Unit Based Team (UBT) and achieved early success with one of his ideas. He actively takes part in education opportunities and will come in on his time off to participate. Melissa is the epitome of optimism. She is approachable, kind and professional in all of her interactions with patients, visitors and her colleagues. Melissa invests in her own learning and shares her knowledge and positive attitude with others. Karyn brings a level of pride to the entire unit and shines so brightly. Karyn is always readjusting her day to meet the needs of our patients. She takes the time to get to know her patients and has the uncanny ability to motivate them. Patients remember Karyn as their nurse. Shannon uses every opportunity to learn and improve her skills. She is very friendly and professional with staff, physicians and patients. She is a real team player with a fantastic attitude. Michlene is hardworking and compassionate. She is never too busy to help out and has mentored so many new nurses over the years. Michlene’s colleagues say she is the type of nurse who many aspire to be. Tammy always comes to work with a smile, good word and soft calming manner regardless of how hectic things may be. She is very well respected by her colleagues for her knowledge which she willingly shares, her support of all members of the team and her mentorship both of new staff and students. Tammy has a depth of knowledge, great compassion and empathy and optimism for nursing. Tim always embraces the opportunity to have nursing students under his mentorship. Tim has been in nursing for 17 years and typically mentors up to three students a year, often with overlap. He encourages his students to really look at, listen to and encourage patients, so they are content when you leave the room. This is success, he says. The patient is smiling when you leave the room. Jackie and Cathy went out of their way to grant a palliative patient at Douglas Memorial Site a wish – to attend her daughter's wedding. Within 48 hours, they arranged for the wedding to take place at the hospital and gathered donations, including flowers, food, photography, jewelry and a mother-of-the-bride dress for the patient. Jackie and Cathy decorated the room with the assistance of their spouses and made this an extraordinary event for all.